Clearing out hard drive space is never fun, so it should at least be a quick and painless task. 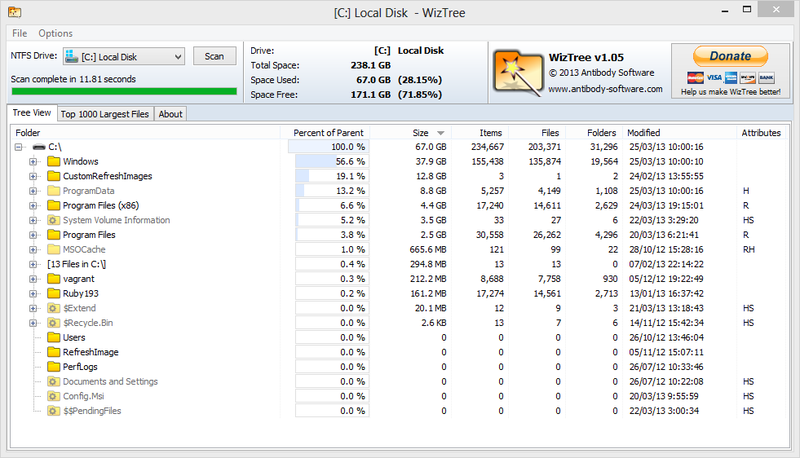 Antibody Software's WizTree is a free and tiny utility that scans NTFS volumes at blazing speeds, making it possible to home in on the largest files and folders in no time at all. It's available in a portable version, too, so you can carry it around on your USB stick to help out friends and colleagues in need. WizTree's simple interface makes it easy to see what's taking up space on your drive. 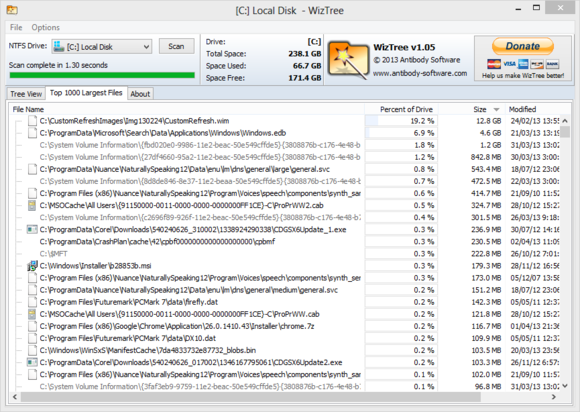 Unlike SpaceSniffer and WinDirStat, WizTree doesn't represent occupied space using a treemap. In other words, rather than get a graphical display in which each folder is a proportionately-sized rectangle, you simply get an ordered list with the largest files and folders on top. It's a simple format, but it's not as intuitive as a treemap. On the plus side, it's extremely fast: WizTree took 1.4 seconds to scan my 256GB SSD, and 7.45 seconds to scan my 2TB magnetic drive. The simple display makes it easy to dig into folders to figure out what exactly is taking up so much space within the folder. The initial scan doesn't just cover the top level: It recurses through the entire drive, so there are no delays as you drill down the folder hierarchy. Subfolders (and sub-sub-subfolders) are instantly displayed with clear percentage bars. The contents of each subfolder is sorted by size, although you can manually sort by name, number of items, number of files, number of folders, or modification time. 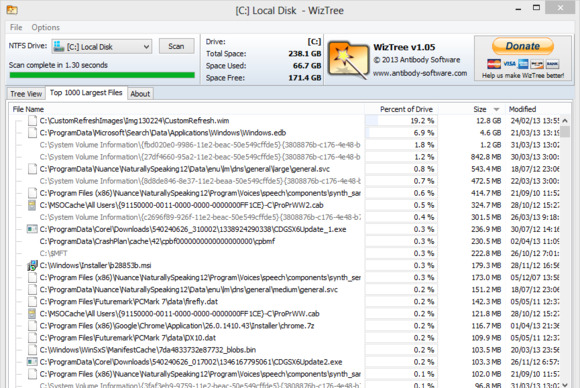 Next to the tree view tab, there's a second tab showing the 1,000 largest files on the drive. That's useful for finding individual files that are hogging lots of space, like VM images, HD videos, and archives you may not need anymore. WizTree's second tab lets you quickly see which individual files take up the most space on your drive. You can permanently delete files from within WizTree, or send them to the recycle bin, and the display updates accordingly. However, if any external activity changes the drive's contents (such as files being copied from another location while WizTree is open), WizTree will not automatically refresh to reflect the changes. In actual use, this isn't much of a problem. WizTree is simple, tiny, and has absolutely no frills. It gets the job done and is easy to use. If you don't need a treemap, it's one solid way to figure out what's taking up space on your drive. Note: The Download button will download the software to your system. This product is donationware. It's free to use, but the developer encourages donations. If you're looking for a very quick and simple way to see what's taking up space on your drive, WizTree can get the job done.